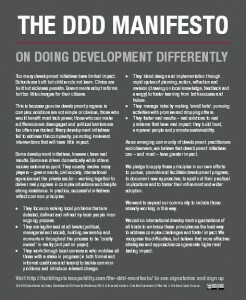 I share the concept of the Doing Development Differently Manifesto to international development. The mission of The Povertist is to promote Doing Poverty Reduction Differently. I established a web magazine, The Povertist, on poverty issues last year in order to create a platform for sharing knowledge and experience. We call professionals and researchers working on poverty reduction ‘povertist’ and invite them to write. Because poverty reduction can be achieved through different ways, experts from different fields work toward the same goal, poverty alleviation. Albeit I understand that there are already some websites with similar missions, their authors are mainly experienced professionals or widely published researchers. Believing in the value of insights, experiences and approaches of smaller organisations and less experienced practitioners, we are trying to help them share their voice. *We welcome professionals to write. Please contact us if interested.